by Manuela Unverdorben and Ralf Homann (see also collaboration) or our homepage. Since 1998 we cooperate in different constellations. 2006 we started the 'Better Think Tank Project' at IASPIS in Stockholm, a long-term research on knowledge-production of neo-liberal networks. 'The Capitalist Ball formerly known as Liberty Ball, formerly known as Capitalist Ball' is one important part of it. One main point of interest in our work is to sharpe the awareness on the changes of meaning of certain terms and its underlying political or institutional agenda. We are interested in the managing of such changes on a symbolic or linguistic level and how this is transferred into every day life. Out of this research we are developing actions and projects that are examining a region between art and politics, symbolic representation and possibilities of intervention in public space. In our ongoing project bttp we will analyze the use of the terms 'capitalism, freedom and liberty' during the currently so called economic crisis and search for esthetical and metaphorical links in the changes to come to this area. Is this possible anyway? For decades this has been my dream. At first, my 1980s generation imagined this as an intellectual practice that was allocated deep inside the social movements. This was mostly investigative journalism, activist research into corporations, extreme-right wing networks and organizations, nuclear energy deals and related lobby campaigns of companies such as Shell that supported the apartheid regime in South-Africa. This type of indy-research was done to inform the movements themselves and provide them with info-ammunition in the fight for the hearts and minds of the people (sometimes confused by us with ‘public opinion’). 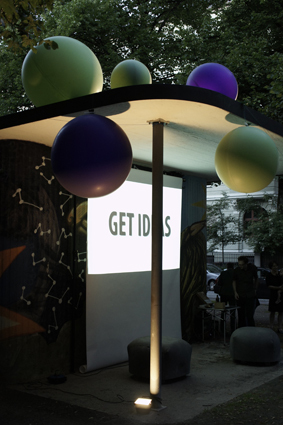 The BTTP Pop-Up Experience was an awesome and remarkable event in Munich's edgy neighborhood Schwabing. Please subscribe our newsletter to get deeper in contact to those events. 2009 we has been organizing the German Semi Final of the Capitalist Ball Formerly Known as Liberty Ball Formerly Known as Capitalist Ball. The winner of the seme final has the chance to visit the upcoming ball in Brussels. The German Semi Final was supported by the Munich Kunstlerhaus and the Munich Capital City Department of Arts and Culture. A brief manual is in the pipeline. If you're interested to organize the next semi final, don't hesitate to contact.